The easy way to remove spa covers . . . almost effortlessly!!! Removing the cover . . . as easy as 1-2-3. Scroll down to browse through information on Spa Cover Lifters. Put an end to struggling with unwieldy covers. A Cover Lifter makes it easy. The right accessory can add to the hot water experience. The Website Store Directory contains an alphabetized listing of all products for sale. We don't just sell products. We help you make a better-informed choice, by providing all the information, you might require. Need ordering help? Scroll down the page, for the Order Desk Telephone Help Number. All items ordered will end up in the same shopping cart, no matter which page of this website, the items are located. All Major Credit Cards and PayPal are accepted. Order one today. Scroll down for product and ordering information. 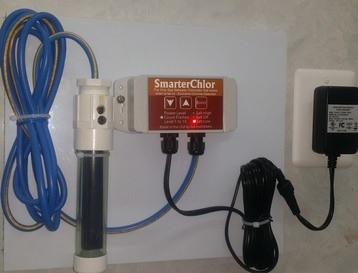 Choose from 5 salt chlorine generator models, with no installation needed. Spa Salt Chlorinators You can add a scenic mural backdrop, to your uplifted spa thermal cover and create a whole new look. Why look at an ugly spa cover? Simple to add. Spa Scenic mural backdrops Testing spa water is important and an all-digital ColorQ tester will make it simple. If there is one thing that people dislike about using a spa, it is removing the cover. It can be a chore to remove and store, as it may be large and clumsy. However, a thermal spa cover serves a necessary purpose: conserving heat and reducing evaporation. The right Spa Cover Lifter will allow you to remove the cover with ease and store it, with convenience. Some simple spa accessories can help increase your enjoyment of the hot water experience. The NEW Model RX Universal Cover Lifter assures that there will be a unit, that is suitable for all types of above ground spas. Read some feedback. These Spa Cover Lifters are the world's leading premium spa cover removal system. It is designed to fit in almost any back yard environment; inside of a gazebo, against a wall, or even mounted into an existing deck. Dual gas springs assist in effortlessly lifting and lowering the spa cover. A locking safety feature holds the cover open until it is time to be closed. A durable powder coat finish accompanied by stainless steel hardware allows the Cover Valet to be equipped with an industry leading 5 year limited warranty. ● Model CV-250 for spas up to 91" in Length. ● Model CV-400 for spas up to 96" in Length. ● Requires only 4" - 6" of clearance, behind the spa. ● Dual gas shock assisted, for effortless operation. ● Variable mounting options, to suit your needs. ● When cover is open, it doubles as a privacy wall or add some Spa Scenery. The Cover Rock-It is a superior cover lift that offers a simplistic design. It fits most of today's spas up to 96", all the while offering ease of use and affordability. The Cover Rock-It slides effortlessly behind the spa enabling a view from all sides. While the spa is in use the Rock-It reduces cover wear and tear by keeping the cover off of the ground. The powder coated finish in addition to the improved frame strength ensures years of effortless spa cover removal. Mounts under the spa, so no screws need to be used, as with older designs. ● Mounts easily under the spa cabinet. ● Under Spa Mount eliminates screwing in the spa. ● Requires as little as 10" of clearance. ● Durable zinc plated and powder coated finish. ● Simplicity means ease-of-use and affordability. ● Features a five year limited manufacturer’s warranty. The new Cover Rx (cover prescription) is suitable for use with virtually all above-ground spas, that are currently today. The unique undermount installation plate allows the Model Rx to be installed on whatever side of your spa, that you require. Only 18" of clearance, between the spa and a wall or obstacle. No matter whether your spa is square, rectangular, octagonal, or round, the Cover Rx can make a perfect fit, No drilling into your spa cabinet is required. Your spa cover is securely supported, by the Model Rx, and does not place any additional stress on the center cover seam. This, in turn, translates to a longer cover life. The Cover Rx can be operated by a single person and from any position you choose: from the side of the spa or from the back. This the most convenient and practical complete spa cover lifter, ever offered. ● Undermount design works with all above ground spa shapes. ● Only 18" of clearance is required, behind the spa. ● Requires no side clearance. ● Works with a range of spa heights, from 24" - 38". ● A gas shock helps, with raising and lowering the cover. ● Made of high-quality powder coated aluminum. ● Does not attach to cover hinge, so cover life is not affected. ● Includes a five year limited manufacturer's warranty. The Cover Caddy gas spring assisted cover lift defines versatility and effortless spa cover removal. It's unique design allows for installation on an array of spa shapes and sizes including round, octagonal, and spas with large radius or cut corners. The Cover Caddy's new under-mount base plate provides for a complete installation within minutes. The addition of a powerful gas spring makes lifting and lowering your spa cover easier than you ever imagined. ● New Undermount-cabinet design works with all spas. ● Gas spring assisted for effortless spa cover removal. ● Stores cover conveniently to the side of your spa. ● Adjustable - raises or lowers spa cover when stored. ● Constructed of high-grade powder coated aluminum. ● Complete installation within minutes. ● Features an industry leading five year warranty. ● XL spacers included for spa covers with 6” - 4” tapers. To read shipping and returns policy, please scroll down the page. Handrail The Spa Side Handrail is the most user friendly spa side assist product on the market. This device provides 180 degrees of movement to allow for easy spa entry and exit. An added locking feature enables the handrail to be fixed in any position for increased safety and peace of mind. The thickness of the handrail grip offers superior comfort to any spa user. The Spa Side Handrail slides under the spa cabinet for complete installation and requires no hardware or assembly. The attractive carbon gray powder coat is accented by the new battery-powered LED mood lighting located on the interior curve of the rail. One year, non-prorated factory warranty. ● Durable zinc plated and carbon-gray powder coated finish. ● Swivels to provide ease of entry and exit. ● Perfect fit for spas up to 40″ tall. ● Locking feature ensures fixed position. ● Soft blue LED lighting completes the look. Towel Tree The Spa Side Towel Tree is the stylish way for a spa owner to keep their towel off of the ground and within reach. Its aluminum construction stands up to the most extreme climates and the detailed powder coat complements the look. The towel tree assembles in minutes and is available in a Bronze or Pewter finish. One year, non-prorated factory warranty. ● Quick and easy assembly. ● Available in a bronze or pewter finish. ● Removable end caps - add sand for increased weight and stability. Model-SV ● For Spas and Hot Tubs. ● Portable Spa vacuuming at its best. ● Cleaning Coverage is 324 square feet per hour. ● Cordless convenience, with no hoses to tangle or store. ● Patented design prevents the return of vacuumed up debris. ● Vacuum head width: 3.5-inches. Includes crevice tool. ● Operates on 3 "C" Cell batteries (not included). ● Batteries last 1.5 hours. Use rechargeable batteries for economy. ● Built in filter bag catches dirt, leaves and debris. ● Washable and reusable filter bag is included. ● Light weight makes cleaning effortless. ● Safe on all surfaces. ● Rolls on wheels for easier motion. ● Includes a 3-part spa pole for easier, extended reaching. ● Weight: 0.7 pounds. Size: 15.1" x 3.2" x 3.5": Not including its 3-part spa pole. Two good choices, to help keep the spa floor clean. Model: AB-Ultra ● For Spas, Hot Tubs, Swim-Spas and Spot Cleaning. ● Portable vacuuming made simple. ● Ideal choice for residential spas. ● Pumps up to 25 gallons a minute. ● Vacuum head width: 6-inches. ● Operates on 5 "D" Cell batteries (not included). ● Batteries last 3 hours. Use rechargeable batteries for economy. ● Easy-grip handle make cleaning effortless. ● Built-in hanging storage notch. ● Weight: 1.7 pounds, with the included extension pole. 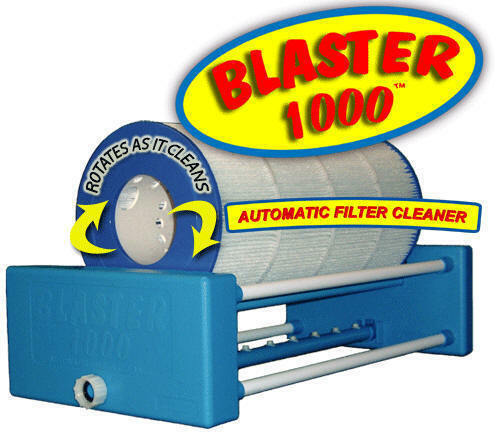 Size: 23.5" x 6.5" x 3.5"
Click to watch a video THE BLASTER Automatic Filter Cartridge Cleaners will automatically rotate your swimming pool or spa filter cartridge, while PowerJets spray focused water, to clean the filter pleats. ● DIMENSIONS: 24" x 12" x 6" WEIGHT: 4.0 lbs. ● DIMENSIONS: 31" x 12" x 6" WEIGHT: 4.6 lbs. Choose from 2 convenient sizes, based on the length of the filter cartridge. The goal is always the same: crystal-clear spa water. Unfortunately, organic byproducts, body oils, organic contamination and mold, mildew and spores don't always make that goal simple to achieve. Spa filters just cannot remove everything. The Nano-Sticks, utilize Nano-Titanium technology, within the ceramic media, to decompose organic matter. This is done without the use of chemicals or resulting in anything being added to the water. The technology only uses light and water to activate its remarkable benefits. In a covered spa, the unit recharges, when the spa is uncovered. It continues to work, after the cover is replaced. You will still have to use the customary spa chemicals, for sanitizing and maintaining proper water chemistry. However, because the Nano-Sticks decompose organic matter, the sanitizer is more readily available to control mold and bacteria. 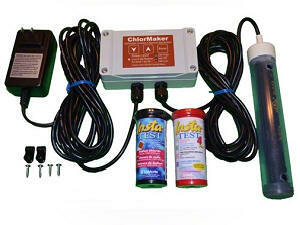 The end result is that sanitizer usage will decrease and water quality will improve. And isn't that what you really want? Better water and fewer chemicals! Lasts for 4-6 months. Why not look at something beautiful, instead of an ugly uplifted spa cover?